French-influenced charcuterie–pates, rolled hams, sausages & meat pastes–are highlights of Vietnamese cooking. 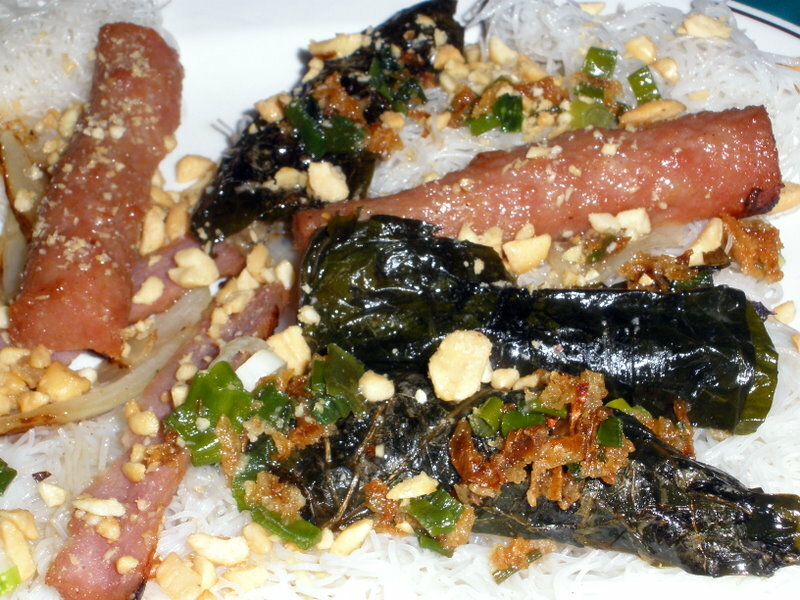 At Dong Phuong Restaurant, connected to the eponymous bakery (14207 Chef Menteur Hwy, 504.254.0214), diners can sample nem nuong (grilled, seasoned ground pork) and bo la lot (ground beef wrapped in grape leaves). Both nem nuong and bo la lot are delicious atop rice vermicelli patties in the dish bahn hoi, which arrives at the table along with an overflowing basket of lettuce leaves, cilantro, mint, holy basil, rau ram, pickled cabbage, carrots, cucumber strips, and daikon. It’s delicious fun to assemble custom lettuce wraps, varying the contents each time. If you visit Dong Phuong, don’t forget to stock up on meat pies at the bakery…my favorite is filled with pork & jicama. Or do I like the barbecued pork better? Or maybe the sausage & egg pies….or the chicken ones…..